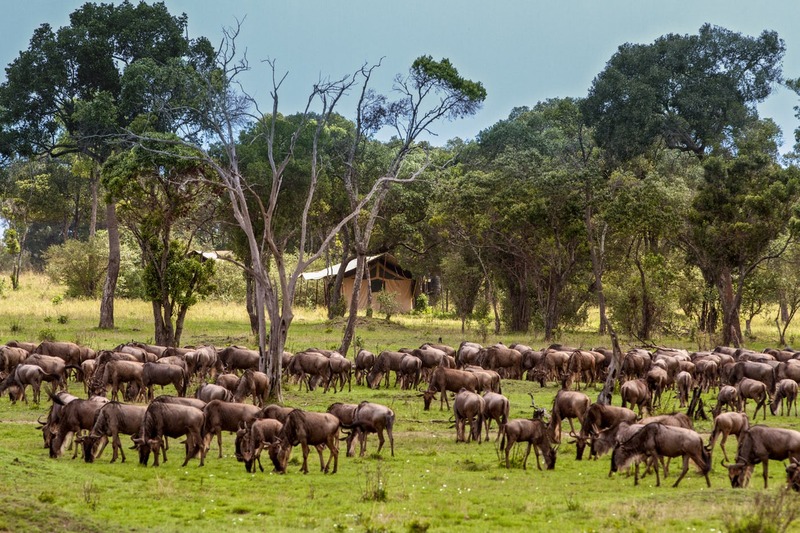 Located 45 minutes from the great Mara River and Lamai triangle where the great wonder of the wildebeest migration. Here, in this immense remote wilderness, almost double the size of the Masai Mara, guests can enjoy fabulous landscapes and terrific game viewing with practically no crowds. Resident wildlife numbers are exceptionally high, with prides of lion up to 30 strong, but nothing compared to when the migration starts arriving from June onwards. The area then turns into a wildlife paradise par excellence until November when the migration heads back south leaving behind a healthy population of resident predators and grazers. The migration and resident game affirm this area’s reputation as one of the finest in Africa. Two of the largest crossing points on the river are nearby and occasionally guests may observe the exciting crossings from the comfort of the camp. The spectacular Lamai triangle, Wogakuria kopjes, and Kogatende airstrip are all very easily accessible. Lemala Mara welcomes children, with a number of age-appropriate activities available to keep young ones entertained including bird and animal identification lessons, wildlife tracking activities and even the chance to help the kitchen team prepare meals.